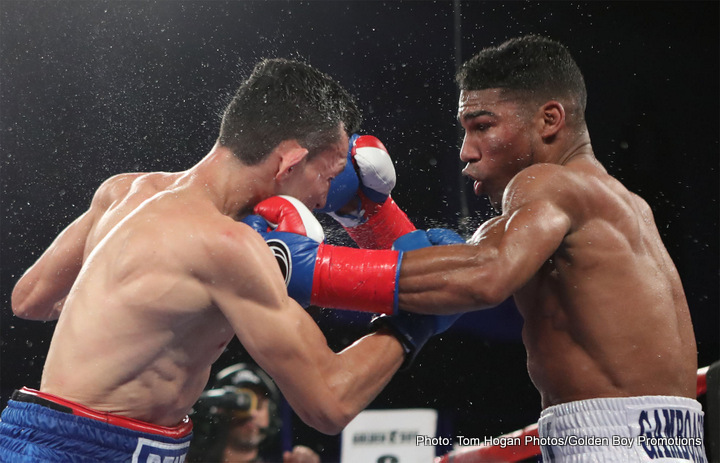 Former WBA and IBF featherweight world champion, Yuriorkis Gamboa, sneaks back into the boxing landscape on August 12th, when he takes on 15(7)-2(0)-1 Alexis Reyes, in the Oasis Arena, Cancun, Mexico. Far removed from his exalted position as one of the most highly regarded fighters in the game, the 35 year old Cuban is attempting to reignite his claim for a title shot against the rugged Mexican. His hopes were earlier extinguished by an upset defeat to the highly experienced and unjustly unheralded Robinson Castellanos, who stopped Gamboa in May of this year. Gamboa, known almost as much for his inactivity as for his talent, will surprisingly be the less ring-rusty of the two. Reyes has not fought since November 16th, also losing his most recent fight, a split decision to the undefeated Alejandro Zuniga. ‘Baby’ Reyes’ other defeat was to 5-2-1 Jesus Silveira, clearly suggesting that he has been carefuly picked for Gamboa, 26(17)-2(2)-0 to be comfortable against. The fight is part of a card which features two-time minimumweight world champion Francisco Rodriguez Jr, who chases a Flyweight title shot. Alejandra Jimenez’s second defence of her WBC Female Heavyweight title, vs undefeated Vanessa Lepage Joanisse, tops the bill. This event is a collaborative promotion, put together by Cancun Boxing, Boxing Time Promotions and Promociones del Pueblo. Televisa Deportes will be the channel which broadcasts this card.